We had left the pleasant uplands of Glen Shee for the sands, the waves, the bracing breezes of Nairn—and to our dismay Nairn was full already. We had then turned our eyes to the varied coastline opposite, stretching away for league upon league toward the Orkneys, and had resolved to try Tain. We had found Tain peaceful and picturesque—but alas! its shores were not for the feet of the paddler or the spade of the digger, and so we had sped northward still, to Golspie. And at Golspie we had found all that we craved. On the north of the bay, where we first sought it, there was just sand enough—we had not yet seen the miles of smooth sand which lie south of the village. Before us, across the steely sea rose far and dim the line of Moray hills; while in front of us the seabirds swam, wheeled, and settled. Behind, brown kye and snowy geese were dotted over a broad belt of green pasture. To left stood the woody heights and gleaming turrets of Dunrobin. To right swept a low shore backed by a crescent of mountains. And Golspie Burn! with its beautiful fall, babbling rapids, and clear pools of brown water ! its rocks and trees and ferns and mosses! and its dusky rabbits scudding away wherever we bent our steps! Yes, certainly we should have found content at Golspie—even if the Sutherland Arms had been less homelike; even if our host, the Duke's whilom gardener, had not joined to it one of the most delightful of simple old-fashioned gardens; even if every noontide a robin (or was he an enchanted prince?) had not come in at the window and by his example gracefully invited us to partake of the newly spread luncheon. I had gone into the village one morning to buy something, and as I came back the boys and girls were at play in the steep playground which slopes down from the School to the road. I stood looking at them, and especially at a game which some of the girls were playing. They were dancing in a ring, reciting as they danced, and then they would suddenly reverse and dance the other way round, still reciting. Presently some of the younger ones—children of perhaps seven or eight— came down and formed a ring in the road before me. In a minute or two some of the older girls did the same. I thanked them all and spun up a sixpence for them to scramble for: then they had to go back into school and I went on to the Sutherland Arms. There I sat down and wrote the proposal for a prize-competition from which you will find some extracts at p. 328. Not being quite certain how that proposal might be generally received, I took it to the Minister of the Established Kirk at Golspie, Dr. Joass, a geologist and archaeologist of far higher than 'local' rank, and always ready to help those who come to him. Armed with the assurance of his sympathy, I next approached Mr.James H. Loudon, the then master of the school, now a master in Kelvinside Academy, Glasgow. He at once entered heartily into the plan, and it is to him that I owe the possibility of carrying it out. In February 1892 Mr. Loudon sent me, as the result of my proposal, the essays of the seven girls and boys whose names are on the title page. At p. 331 you will see some particulars as to their ages, parentage, and places in the competition at large and in the several branches of it. As six out of the seven afterwards won 'district prizes,' it cannot be said that the competitors were not a good representative team. The italicized extracts from those essays which form the basis of this book are in the exact words and spelling of the originals and each is followed by its writer's initials: everything else, including notes and headings, is mine. But I have not felt myself bound to follow the writers in their punctuation (in which I include the hyphen and apostrophe), their use of capitals, or their division into paragraphs or verses. Dempster (Miss) The folk-lore of Sutherlandshire. In the Folk-lore journal, vol. 6, 1888. 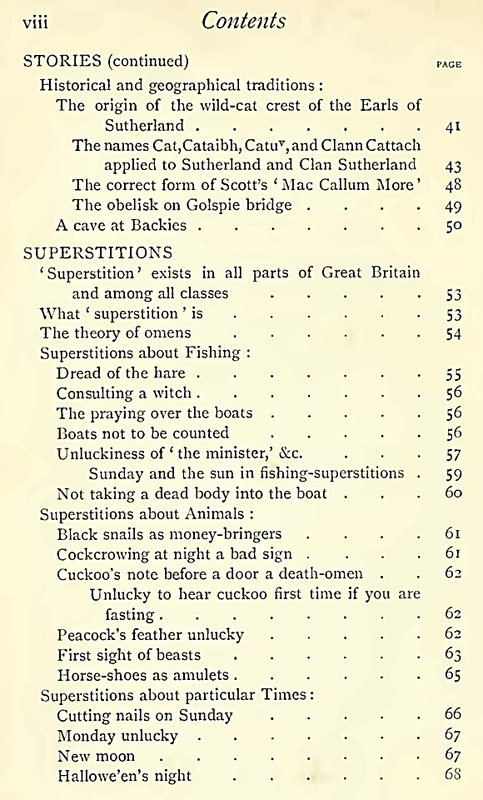 Napier (James) Folk lore: or, superstitious beliefs in the West of Scotland within this century. 1879. Gregor (Rev. 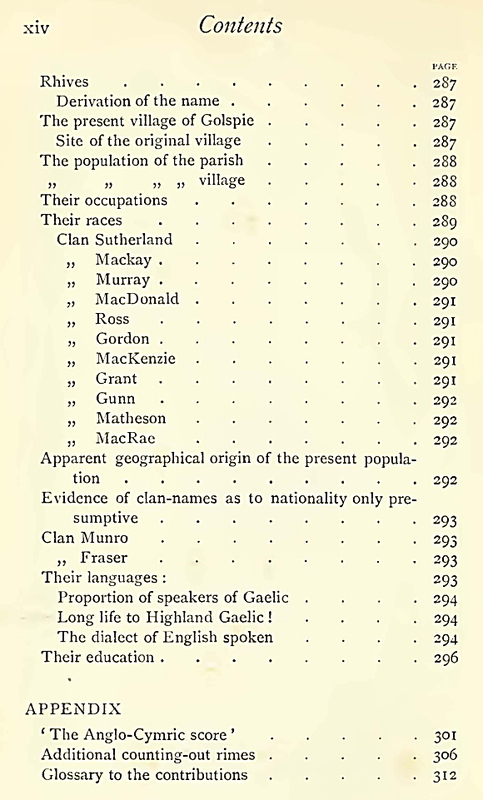 Walter) Notes on the folk-lore of the North- East of Scotland. 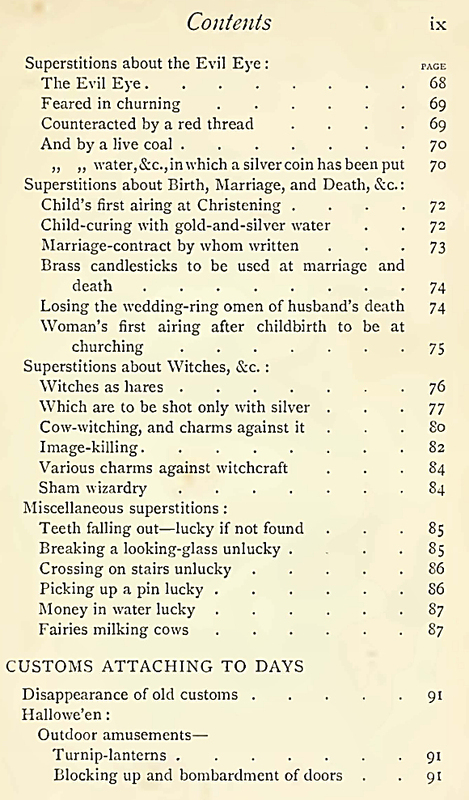 1881 (Folk-Lore Soc, vol. 7). Henderson (W.) Notes on the folk-lore of the Northern counties of England and the Borders. 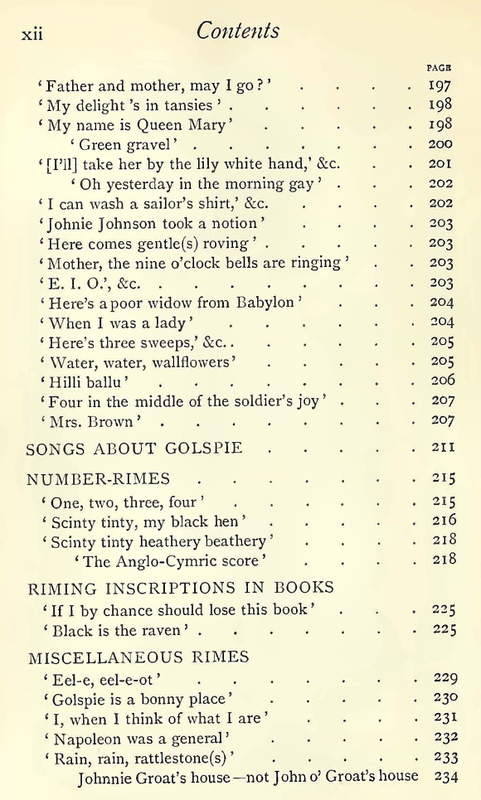 1879 (Folk-Lore Soc, vol. 2). Shropshire folk-lore. Ed. by Charlotte S. Burne from the collection of Georgina F. Jackson. 1883. Choice notes from ' Notes and Queries,' Folklore. 1859. 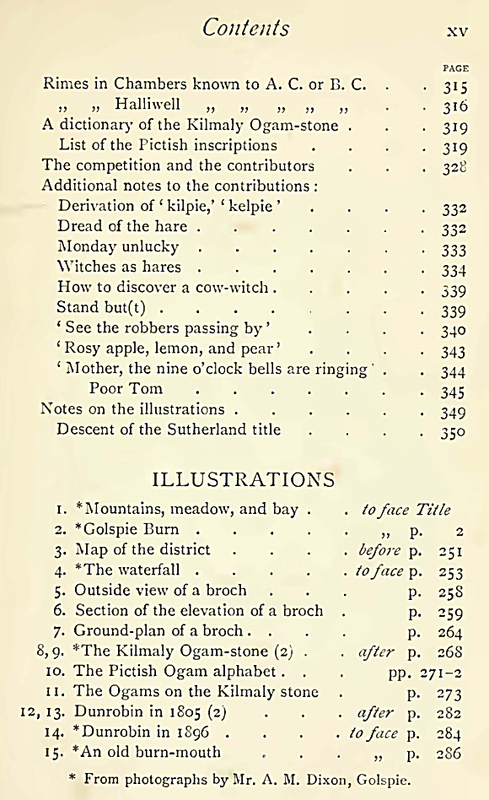 Chambers (Robert) Popular rhymes of Scotland. Northall (G. F.) English folk-rhj'mes. 1892. Halliwell (James Orchard) Nursery rhymes and nursery tales of England—an undated edition containing xv + 352 pp. 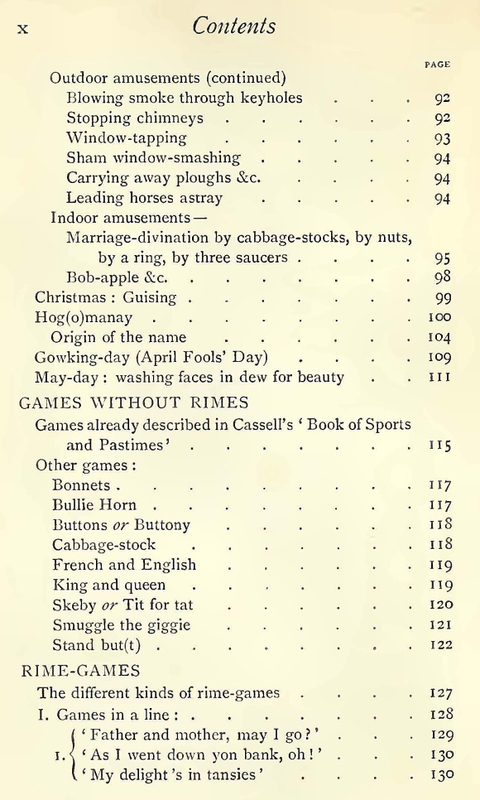 Udal (J. S.) Dorsetshire children's games, etc. In the Folk-lore journal, vol. 7, 1889. 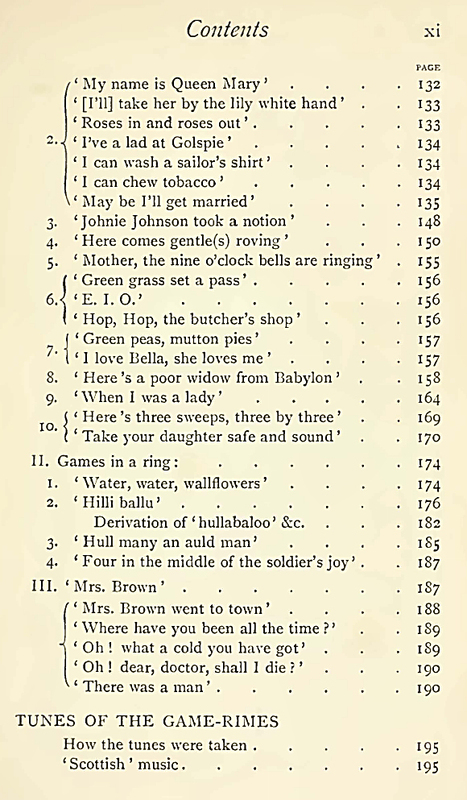 Newell (William Wells) Games and songs of American children. New York, Harper & brothers. 1884. Bolton (Henry Carrington) The counting-out rhymes of children. 1888. Allen (Miss) Children's game-rhymes. Copied down from word of mouth by Miss Allen, School house, Hersham, Surrey. In the Folk-lore record, vol. 5. 1882. All the parts of my book which deal with games had been written before I saw the announcement of Mrs. Gomme's very valuable work. The first volume of that was published in 1894, and, although it contained no games from North of the Moray Firth, it afforded me some new illustrations from other parts of the country. I was anxious to get the benefit of her second volume as well, and, since it had not appeared up to the spring of 1896, I took a friend's suggestion and asked her publisher if she would exchange proof-sheets with me. This she has very kindly done, as far as hers were ready (down to ' Sally Waters', and I hope my young Golspie friends and I may have furnished to her as much aid as she has to me. All my obligations to her are separately acknowledged. Visiting Golspie a third time in 1893, to complete my book, I came by chance to study the Pictish inscriptions of Scotland, Orkney, and Shetland, which had not hitherto been solved. Their solution will be found in my work on ' The vernacular inscriptions of the ancient kingdom of Alban,' published in 1896, which I cite simply by my own name. Its preparation and printing kept back the present volume for more than two years, but my new study furnished so much additional information which I have been able to use in these pages that the delay proved ' a blessing in disguise.' Before I came to prepare them I had merely browsed now and then on folklore, as on much else, in a very casual kind of way. 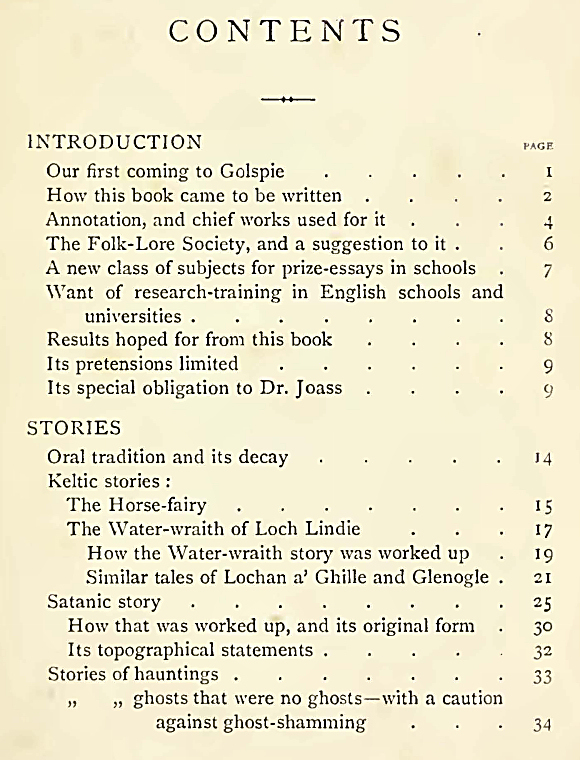 There is a Folk-Lore Society, which has many distinguished men among its members, which has published and continues to publish a valuable journal and important works—among them being a Handbook of Folklore^ which is priceless, and only costs half a crown. If I may offer to that Society some suggestions which occur to me, they are these. Instead of being a London society without branches, start, if 3'ou can, a branch in every town and considerable village in the kingdom, and set about collecting. And, when you do so, begin with the young. They will collect for you not only from those of their own age but from their elders as well. And, if a stray tourist can so easily obtain in one small place in our furthest North the amount of curious matter which you will find in these pages, by way of answer to his few hastily prepared queries, what cannot you collect by organized effort? Try, gentlemen, try. The public will surely help you, if you ask it ; for we have all been children once, and many of us would be glad to be children again. If the following pages do anything to stimulate in these ways the collection of folklore, they will not have been written in vain. Nor will they if, by giving to any of the young folk of Golspie itself some idea of the wealth of their own neighbourhood in what is ancient and curious, they lead any such boy or girl to study its folklore, its antiquarian remains and history as an inhabited place, or its geology—and to put the results of that study some day on record, for the interest and instruction of their fellow-countrymen, in a volume much more adequate than this. 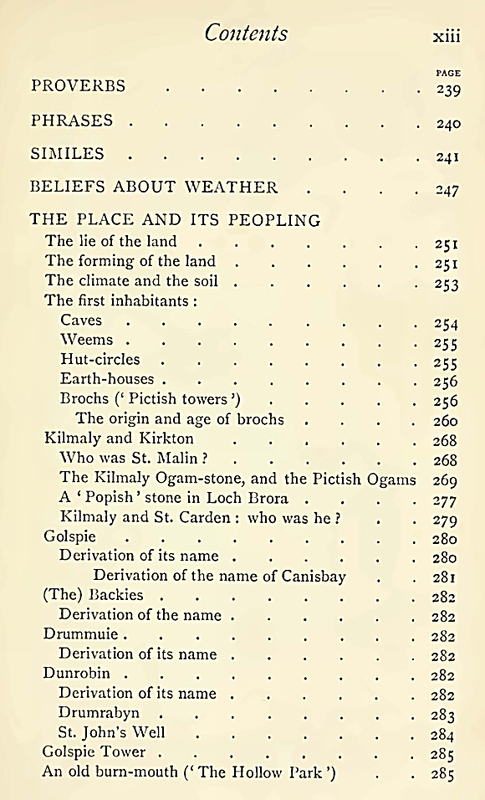 For my chapter on 'The Place and its Peopling' has as little pretension to be a history of Golspie as the earlier part of the book has to be a complete collection of its folklore. But some account was needed of the 'folk' among whom the 'lore' is current, and of their antecedents. How much that account owes to Dr. Joass I can hardly estimate. It was he who first described to me, and who personally showed me, the weem, the hutcircle, the earth-house, and the broch. And — although I have everywhere read and thought for myself, and am alone answerable for any error of fact or judgement w^hich can be discovered—I have received from him in other parts of that chapter so much correction or assistance, beyond what is there acknowledged, as to leave me greatly his debtor for whatever value I have succeeded in giving to it.